These are the paraphrases of just about every text, Facebook post and social media DM I’ve received since spreading the word that I was headed to the Republican convention in Cleveland this week. The absolute palpable fear on the part of black people I know about the dangers of going to the convention of a party that was about to nominate Donald Trump was evident in every exchange. In the wake of high-profile police shootings in Dallas and Baton Rouge, La., there was every reason to believe that right-wing conservatives would use the Cleveland convention as a billboard for their “tough on activists” rhetoric and crack down like there were no tomorrow. Is it really that bad on the ground though? It depends on whom you ask, how you dress and what kind of colors you’re showing. I am not a war correspondent, but I have covered some fairly volatile political events in the last few years. I was at the massive protest marches by the YoSoy132 movement during the Mexican presidential elections in Mexico City. YoSoy132 was a student movement that led to over 10,000 citizens marching on the largest television network in Mexico to protest biased reporting and government corruption. I was also in Ferguson, Mo., during the protests, and, to be honest, I felt less safe than in Mexico City. Everyone was terrified of going to Cleveland, and a colleague insisted that I go to journalist “riot training” before heading to the Cleveland convention. This was helpful, but also heightened my concerns that a city like Cleveland, which I have lived in for over a decade, wasn’t nearly as safe as I wished it could be. Don’t worry about abandoned buildings? Clearly, he’d never been to downtown Cleveland. 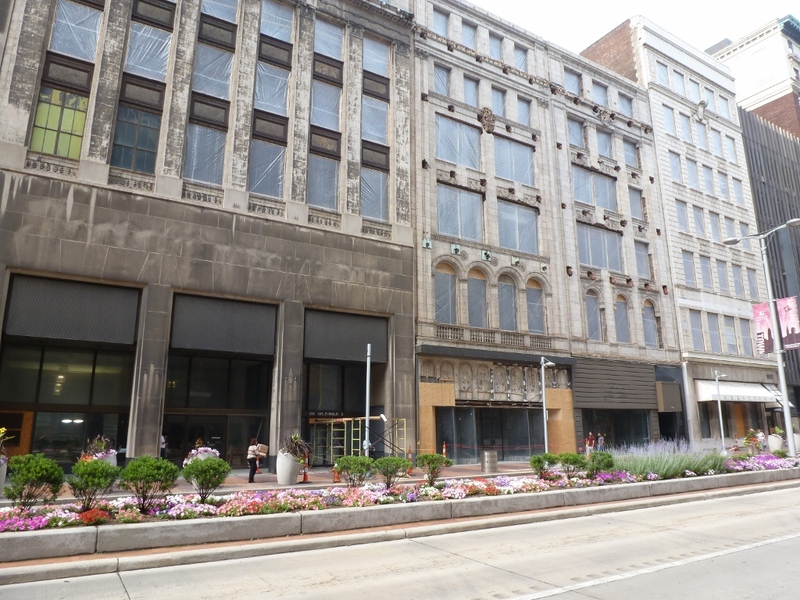 While much of the downtown has been revitalized, the upper echelons of the old buildings downtown are still empty and haven’t been used in years. However, many of my fears and concerns have been unrealized in my first two days at the Republican convention, in large part because I am—ironically at a Republican convention—the right color. By that color, I mean, yellow, red, silver or taupe: the colors of the press. The police have been on extra-special nice behavior throughout the week, especially to the members of the press and, oddly enough, even to protesters. As of the first two days of the Republican convention, and protests throughout the city, only five arrests had been made. “The police chief said they are going to let everyone practice their First and Second Amendment rights,” says Jeff Johnson. Johnson, whom many know from his media work and activism, is working as a communication liaison for the city of Cleveland during the RNC, and had high praise for how the police have handled things thus far. He pointed out that there was a distinct effort on the part of police to not focus on small petty crimes and only target significant threats. From my own observation, this seems to be the case thus far. I saw five police officers charge after a man who was wearing a Guy Fawkes mask and aggressively ask him what was under his shirt. Cameras all swerved toward the incident, which happened just behind the MSNBC booth on the main convention strip. But as soon as it started, it was over. The man, who smirked at the cops and chided them, was left alone, and I saw a few police officers walk over to him later and laugh with him and apologize. Even at night, I saw a black woman walking along the side streets where about 100 officers were congregating, and they all just parted like the Red Sea for her to pass by without so much as a word. It hasn’t all been perfect; this is still America, and it’s still Cleveland, and it’s still the Republican National Convention. On Monday, I observed neo-Nazis attempting to record and provoke activists into a conflict with police. I also saw a woman speaking in the town square asking for justice for Tamir Rice, only be arrested, strapped to a gurney and whisked away by the police. She screamed her name, address and telephone number in fear of never coming back alive. Is the Republican convention a safe place to be for a black person? Perhaps. If you are a member of the press, there seems to be a distinct effort to treat you better, which is certainly more than can be said of Ferguson or Baltimore. Also, the numbers of arrests seem to suggest that activists and police officers have been getting along peacefully through two days. However, there are two days to go, more people showing up every night, and Donald Trump has yet to make his acceptance speech. The city of Cleveland has made America seem safe again, but who knows how long that will last? The Root: Bernie and Hillary Want to Know: Who Would Trayvon Martin Vote For? As the race for the Democratic nomination gets tighter, the serious gaps between presidential candidates Hillary Clinton and Bernie Sanders and the black Democratic voters they seek become more and more apparent. The Clinton name in the black community has retroactively sunk faster than the names Tavis Smiley, Bill Cosby and Stacey Dash combined. Her campaign’s grotesque race-baiting in the 2008 primary against then-Sen. Barack Obama is still fresh on the minds of many voters. Combine that with Clinton’s silence on the New York City Police Department’s stop-and-frisk program, Chicago Mayor Rahm Emanuel’s handling of the Laquan McDonald case, and her years as a “tough on crime” advocate in the ’90s, and it’s apparent that these missteps have made her a tough sell for many black voters. Sanders, for his part, isn’t doing much better. Sanders seems to have all but discovered that black people existed last summer. He is a nonentity with the Congressional Black Caucus, despite having been in the Senate for almost 30 years, and he alienated much of the Black Lives Matter movement with his crusty Larry David impression during the Netroots Nation convention in the summer of 2015. So, what do these campaigns do? In a move that pushes the envelope regarding both political expediency and decency, the two campaigns have embarked on a Black Lives Matter endorsement primary that seems more about their political lives than the lives of black folks. What is the Black Lives Matter endorsement primary? It’s the rush from both team Clinton and team Sanders to secure the public support and endorsement of victims. Yes, victims of horrible acts of violence by police officers, vigilantes and eventually the justice system. Moving beyond elected officials or public activists, both Democratic candidates have sought endorsements from the families of Michael Brown, Eric Garner, Trayvon Martin, Tamir Rice and others. Starting late last year, several members of those families have actually come out and publicly endorsed one campaign or another. Endorsements are extremely important during political primaries; the more endorsements you get, the more likely you are to win your party’s nomination, especially at the presidential level. A senator’s endorsement gives you access to donors and voter lists, while a mayor may introduce you to local activists and volunteers. None of these men and women in the Black Lives Matter primary, however, are elected officials, and none of them have stocks of cash. It’s not even clear that African-American voters would be moved by the endorsement of any of these people, despite their notoriety. Is it even appropriate to ask or accept the support of victims’ families? More important, why are these campaigns so desperate for these symbolic taps of authenticity? Politics is a cynical game, and although it’s possible that both campaigns just want to rack up as many black endorsements as possible—no matter who the endorsers are—it still begs the question as to whether any real policies are being offered that could have changed the suffering of these families. “If Bernie got Erica’s [Garner] vote, he did something to earn it,” said Maria Chappelle-Nadal, a prominent state senator representing Ferguson, Mo., and an advocate within the Black Lives Matter movement. Chappelle-Nadal, who has yet to endorse any presidential candidate, has nonetheless been approached by both campaigns. She notes the importance of Black Lives Matter endorsements from elected officials but thinks that endorsements from victims’ families are a different thing entirely. It’s a result that we’ve already seen in the Black Lives Matter endorsement primary in a somewhat awkward way. In late January, Gwen Carr, the mother of Eric Garner, penned an essay endorsing Clinton. Just over a week later, Erica Garner, the daughter of Eric Garner, wrote an essay endorsing Sanders in the Washington Post. Justin Bamberg, a state representative in South Carolina and lawyer for Walter Scott’s family, initially endorsed Clinton, then switched after a sit-down with Sanders. In none of these cases do these endorsements make any real policy distinctions between the Democratic candidates. Which makes the aggressive pursuit of these endorsements by campaigns more about symbolism than any actual policy changes. While it may be harsh to say, these families have nothing significant about them other than the fact that their loved ones were victims of police or vigilante violence and a corrupt and racist justice system. And that, unfortunately, is a fraternity of pain that actually has many more members than the short list of people who have become well known and whose endorsements are being so desperately sought. The degree to which any member of any victim’s family feels the need to endorse a particular candidate is his or her prerogative. However, given both candidates’ newfound religion when it comes to criminal justice, this Black Lives Matter endorsement primary smacks of exploiting, in the name of political symbols and campaign expediency, families who are desperate for hope and justice. With so little to stand upon to earn the black vote, Clinton and Sanders are willing to cover up the holes in their own policy histories with lives of slain African Americans. Hopefully they’ll care more about black lives in the future than they have in their policy pasts.